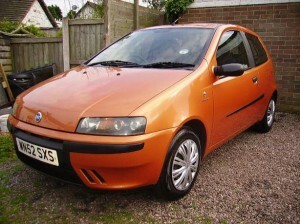 This morning we got call to deal with a lost car keys situation on a Fiat punto 2002 in Camborne, the customer had contacted Vospers garage in Truro as they are a Fiat dealer, they then suggested that she call me as we are a specialist vehicle locksmith and they know us as we work with alot of local dealerships throughout cornwall. We seem to get alot of Fiat vehicles, either spare car keys, or as in this situation total lost car keys, i think the main reason for this is that we are a far more cost effective alternative compared to the dealer when it comes to Fiat car keys. Not only are we more cost effective in this situation but we can also come to the car which saves vehicle recovery charges to a garage and also as we can make the keys from decoding the locks whereas a dealer will have to order the car keys in which in some cases can take up to ten days. 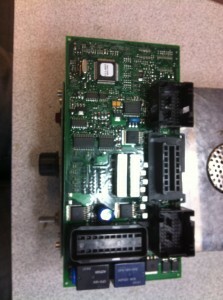 Fiat punto bsi reading to generate transponder chips for keys. When we arrived on site in Camborne the first job was to gain access to the vehicle, this was done using normal non destructive methods, once we had gained vehicle entry a lock was removed and decoded, the new car keys were then cut on site from are fully equipped mobile workshop. As with almost all car keys these days, they contain a transponder chip in the head of the key, without this chip the vehicle will not start, so the next step to get this vehicle running was to remove the Fiat bsi unit from the vehicle, once removed from the car we then remove a eprom chip from a circuit board within the bsi unit, then using specialist auto locksmith equipment we are able to generate the transponder chips to start the vehicle. Once the chips are generated and the new files are written back to the cars bsi unit everything is re-assembled and fitted back to the vehicle, keys are then tested and job is complete! Sounds simple but it’s not, being a locksmith in cornwall for many years we have seen many people attempt this sort of work not just other locksmiths but garages too, and we have seen many make a real mess of it!! For more information on all our services vist the Key Machine or call 01326 376338 We cover domestic, commercial and auto locksmith work in Camborne, Redruth, Hayle, Penzance, Helston, Falmouth, Truro, Perranporth and throughout most of west cornwall.